ESB started in 1915 as the Ellwood Federal Savings and Loan in Ellwood City. It converted to a public company through a Mutual Holding Company conversion in 1990 and performed the second step conversion in 2001. Since its humble beginnings, it has grown to 24 offices and $2.0 billion in assets. 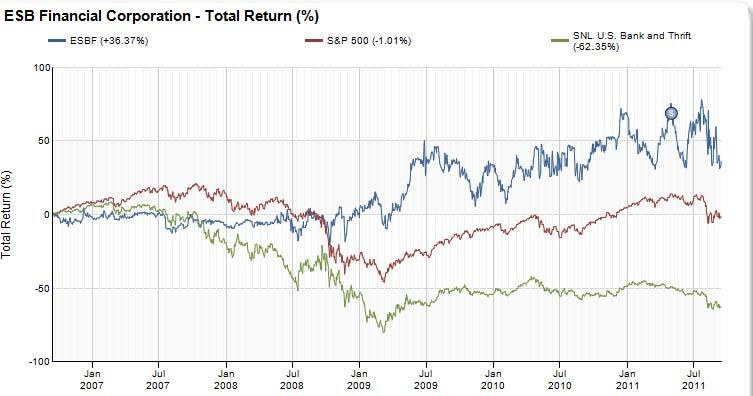 Since 2006, it has returned 32% to shareholders as the industry returned -62% (see chart). How has ESB done it? Upon reviewing their financial performance and reading their annual report and website, it appears as they do it through plain vanilla banking, a style that this blogger has expressed concerns about its future viability. But you can't argue with results. ESB operates like many other thrifts... i.e. low net interest margins (currently 2.75% at the bank level), accompanied by a low non-interest expense to average assets ratio (currently 1.44%/the "expense ratio"). The expense ratio is extraordinary, as typical commercial banks hover around 3% and thrifts register in the 2.50% range. ESB does traditional mortgage lending, with some commercial real estate too, funded by retail deposits with a heavy dose of CDs. Whether you like this model or not, it has delivered tangible book value and earnings per share growth that has driven its total return to shareholders (see table). 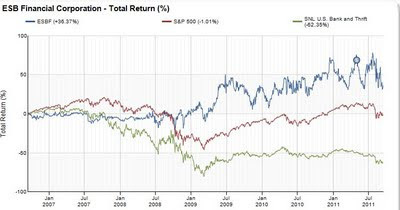 If you believe traditional thrifts currently trade on book value, as I do, then 12.42% compound annual tangible book value per share growth should deliver superior returns, all things being equal. Add a 3.68% current dividend yield, and the "plain vanilla" thrift is delivering to their shareholders. Part of the secret sauce may be management longevity, as most senior managers, including CEO Charlotte Zuschlag, have been with ESB for 20 years or more. This gives employees comfort in management consistency, management a deep understanding of bank operations, and customers comfort in seeing familiar faces at the bank and in the community. • Seeking and consummating acquisition opportunities when practical." She didn't say anything about economies of scale, regulators, or leading edge technology. The first bullet is very telling. Perhaps other bankers should take note. Note: I make no investment recommendations in my blog. Please do not claim to invest in any security based on what you read here. You should make your own decisions in that regard. My year to date return on bank stocks... negative. Need I say more?